​There are more than 12 million registered vehicles in Pennsylvania, with more than 2 million of those being either large trucks or buses. That's a lot of heavy vehicles on our roads — and it doesn't even include the trucks and buses registered in other states that are transporting people and goods through Pennsylvania. Because of their immense size and weight, trucks and buses have many special considerations for both their drivers and those driving near them. A fully-loaded tractor-trailer truck in Pennsylvania can weigh up to 40 tons, which is 38 tons more than your vehicle. This means a truck will take almost twice as long to stop as your car — and even longer on wet pavements. It requires almost two football fields to stop under good conditions! Trucks and buses also have limited maneuverability, so extra care is needed in places with space restrictions, such as work zones, truck stops, and service stations. Never try to pass a truck to the right when it is turning right. A large truck or bus can't easily turn from the right lane, so it will move left to create enough turning space. If you try pass on the right, a crash could occur as you get stuck in the "right turn squeeze." 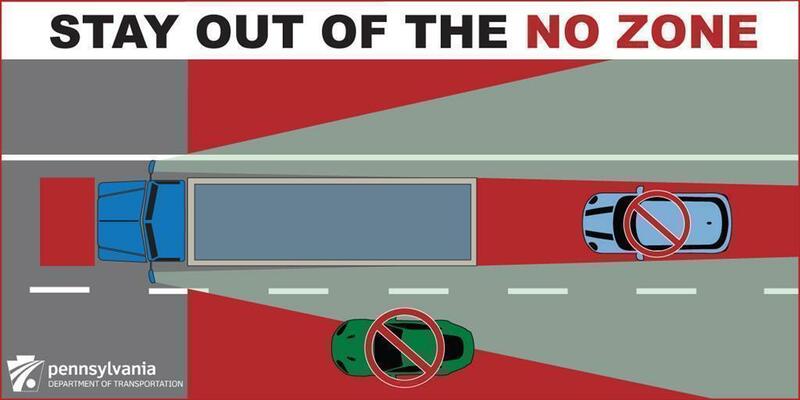 Large vehicles also have large blind spots, commonly referred to as "No Zones." Stay out of these blind spots when a truck is turning, backing up, or changing lanes, and be aware of these spots when passing. In general, if you can't see the truck driver in his or her side mirrors, the driver can't see you. When you're following a truck, even in slow-moving traffic, be sure to stay far enough back, and even out a bit to the left, so the driver can see you in the rearview mirror. When you are far enough ahead of the truck that you can see the front tires in your rearview mirror, it is safe to pull in front of the truck. For more information on sharing the road with large trucks and buses — including tips for bicyclists and pedestrians — visit the Federal Motor Carrier Safety Administration website.